With upcoming Zentangle workshops (see our events list) and a whole display of supplies in the Keeton’s retail store, you’re probably wondering what the craze is all about. You may have seen Zentangle designs before and thought it was way out of your league, but we’re here to tell you that you’re wrong. Zentangle is surprisingly easy to learn and you don’t even have to be skilled at drawing! Let’s take a look at some of the characteristics of this type of artwork that will get you hooked! 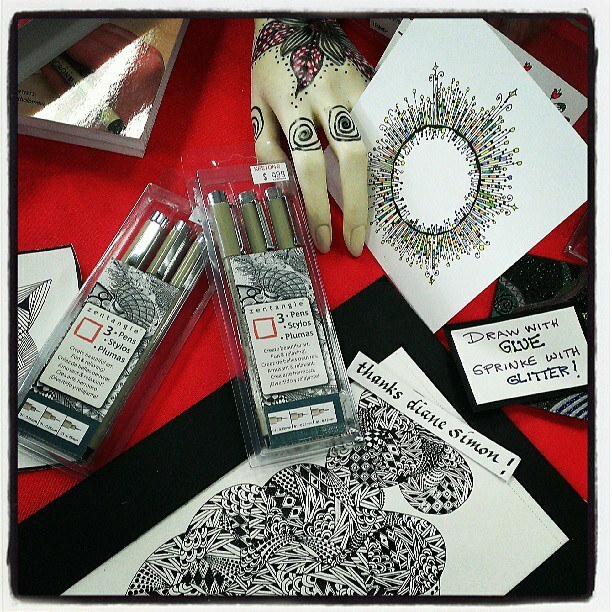 Zentangle is basically a doodle – a structured, repetitive doodle. It is said that this doodling term was thought up by Rick Roberts and Maria Thomas. Maria described her experience while creating this type of art as “feeling timeless, free and engendering a sense of deep well-being”, or in a state of Zen (hence the name). The intricate patterns you often see in Zentangle art are actually quite easy to create. Since Zentangle is simply a repetition of patterns, you can start with simple, easy patterns and work your way up to more detailed designs as you become familiar with the technique. When working on a Zentangle piece, not only are you creating a beautiful unique piece of artwork, you are also relaxing -one of the great benefits of organized doodling. Have you ever started doodling on a scrap piece of paper while on the phone? When you do this, you’re relaxing your mind. Zentangle does the same exact thing, just in an organized way! The repetition of patterns encourages relaxation as well as focus. When working on a Zentangle piece, you never know how the final piece will turn out. No matter what’s on your mind, each time you sit down to Zentangle you’ll end up with different results. Hint: don’t go into it having an idea of what you expect your end result to be and you will be pleasantly surprised with your final piece! When it comes to Zentangle, you don’t need various sized brushes, canvases, paint, or palettes as you would with other types of art. Few supplies are needed and you can take it anywhere! As mentioned above, very few supplies are needed for Zentangle but it is important to choose the RIGHT supplies for the best results. When it comes to paper, you want to look for a heavy-weight artist paper. Lighter paper choices do not work well with the pens you will be using! They can bleed through thin paper and make a mess. Some prefer to Zentangle on tiles, or pre-cut squares. You can always cut your larger paper sheets down to any shape or size that you desire. *Be creative! You don’t necessarily HAVE to Zentangle on paper. In the past, we had a Zentangle on dominos workshop. Try to do different things with your Zentangles and of course, let us know how it turns out! It’s important when shopping for Zentangle pens to choose one with a very fine point. This will allow you to create very intricate, detailed designs. We recommend a Micron 01 (or 0.25 mm) which can be found at Keeton’s. Black pens are typically used for Zentangle but other colors may be used as well (and are also available in the Micron pens). If not a Micron pen, choose one that is permanent and fast drying to avoid smudges! While most of your Zentangle design will be created using the pens mentioned above, pencils are used for shading and strings (lines that divide the piece into sections). Zentangle books provide different patterns for inspiration, which is especially helpful for beginners. Keeton’s has numerous books on Zentangle, just stop in and take a look! Since Zentangle is essentially a doodle, there are no specific instructions on how to achieve a unique design. The best way to understand Zentangle is to see it in action! The following video is great for understanding the basics! For more upcoming workshops, view The Artist’s Corner! And don’t forget to sign up for The Nook, an email newsletter from The Artist’s Corner.